Made of good quality PE fabrics, features of prevent ageing and anti-corrosion. 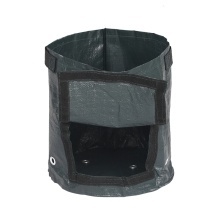 Durable fabric grow bags with well drainage and aeration, which allows the plant roots to grow well and faster. Breathable window design on the side. Designed with handles, convenient for moving them around. Perfectly for growing potato, tomato, eggplant and other vegetables and little plants. This sturdy potato bag is really awesome for patio gardening or gardening beginner.